1922: Coach Fred Dawson warns against overconfidence as he looks forward to fall. 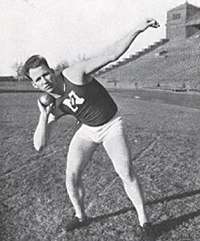 «1932: Hugh Rhea, Nebraska's All-America tackle, sets a national collegiate record in the shot put with a throw of 52 feet, 5¾ inches at the NCAA track and field championships in Chicago. Meanwhile, the university reduces football ticket prices for the 1932 season. 1942: One former Husker (Chick Justice) replaces another (George Sauer) as head coach at New Hampshire amid the wartime disruptions for college football. 1962: Tom Osborne, who assisted on a volunteer basis during spring drills, is now officially a graduate assistant on Bob Devaneys staff. 1967: Former Husker quarterback Bob Churchich chooses baseball over football as he signs with the Atlanta Braves. 1972: Bob Devaney names 49 players, including four former Huskers, to the college all-star team that he will coach in late July against the Dallas Cowboys. The Huskers on the roster: Quarterbacks Van Brownson and Jerry Tagge, running back Jeff Kinney and defensive lineman Larry Jacobson. 1992: With a search for his successor officially under way, athletic director Bob Devaney says he wants assistant A.D. Al Papik to replace him, with Tom Osborne perhaps assuming the post after five years. Also, Scott Baldwin is acquitted in his assault case by reason of insanity. 2002: Husker free safety Josh Bullocks is injured in an ATV accident. 2007: Millard North's Sean Fisher chooses the Huskers over Oklahoma. 2012: Nebraska is No. 2 in a ranking of football facilities in the Big Ten.